Is it a boy or a girl? Which Baby Block will you be blessed with? With the help of MSQC's cutest family members and their mamas, they were able to bring you--their extended MSQC family--their most special and adorable edition of Block Magazine ever. 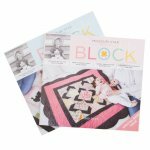 The Baby Block comes in two different covers: boy and girl! So when you check your mailbox, you could be blessed with either the Boy or Girl Block. Not only will you enjoy the smiling babies in this issue, you'll also be excited to see 10 whole patterns AND 6 classroom projects! We think you'll agree that this Block is a true bundle of joy.